Our dancing season starts in earnest over the Easter and May Bank Holidays. First up is a return trip to the English Festival which is being held at the Riverside Country Park in Lower Rainham on Easter Saturday. This is a great celebration of all things English and is well worth a visit. Then there is our traditional 1st of May dance over Barming Bridge. Not only can you witness the spectacle of the dancing, there will be cake provided! Definitely not to be missed. The Saturday of May Bank Holiday weekend sees us at the Offham May Day celebrations. This really is a wonderful event that engages the whole village and there is so much going on. 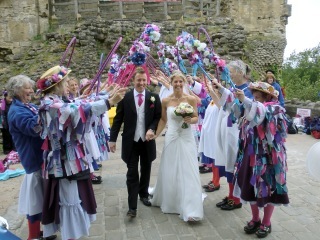 It all starts with a procession through the village which is followed by the crowning of the May Queen. For more information, click on one of the diary items below or go to our Programme Page. If you would like to book us for your fete, show, wedding or any other event, please read our booking FAQs by clicking here and then go to the Contacts page. You can use the Google "site:" facility to search the whole of the Kettle Bridge site for a particular word or phrase. Type the text into the box below and click on the "Search" button.